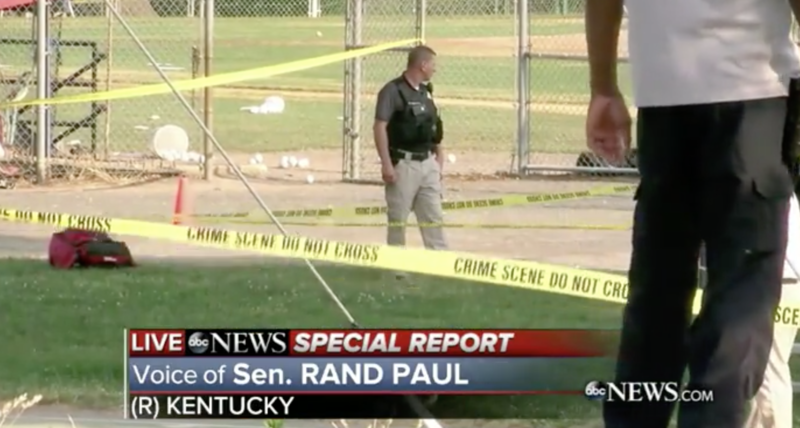 The horrifying scene at a practice field in Alexandria, Virginia, at which Congressman Steve Scalise was shot in a shocking flurry of gunfire, could have been much worse. Rand Paul pointed out that “it would have been a massacre” had a member of the House leadership not been there. His presence guaranteed that the heavily armed Capitol Police could take him down. Many others present expressed similar feelings. They were sitting ducks. If the offensive gunfire could not be met by defensive gunfire, the bloodshed would have been far worse. As this case shows – and there are millions more like this one – force must be met with force to stop the violence.The aftermath will include all the usual questions. What were the gunman’s motivations? Shooter James T. Hodgkinson’s Facebook page shows that he is a supporter of Bernie Sanders and socialism generally. Where did he get the gun? Did he obtain it legally with all the appropriate background checks? What does this scene imply about gun regulations and controls on distribution? To some degree, all these questions are beside the salient point. As this case shows – and there are millions more like this one – force must be met with force to stop the violence. If a murderous monster has the most firepower in the space, everyone else’s life is in the balance. The calls for gun control refuse to deal with this reality. To the extent they succeed in restricting people’s rights to defend themselves and others, they bear moral culpability for an increasingly violent society. What happened at the baseball park was a classic case of defensive gun use. In the entire debate over guns, this is the point I find most compelling in a practical sense. Despite being raised in a gun-owning family, and having spent many hours at gun ranges and owning some myself, they are not my favorite things, which is to say I don’t really like them. I have no romantic attachment to them at all. I would rather live in society without them. There is a strong reason for people like me to hope for a wide distribution of guns and firing skills. And yet a society without guns is not an option. Given this, there is a strong reason for people like me to hope for a wide distribution of guns and firing skills. It is precisely because of my attitude, and others like me, that I hope that there are plenty of others out there, who have my back in case like this. This is why the prevalence of private owners carrying guns makes me feel safer. To be sure, there are bad actors but the best foil to them are good actors who serve as a counterforce. Once you pay attention, you see examples everywhere. Knowing that there is no way for government to ban guns — there is a black market in nearly every country with severe restrictions — the best protection for everyone is for ownership to be widespread and distributed through the population. So I would like to make a plea to my fellow citizens: please buy guns. Carry them. Keep them in your homes and cars. It’s especially important to do this in public places, where freak murderers could conceivably lurk. The weapons should be loaded and dangerous, capable of killing with one shot. I want every robber around every corner to hold the expectation that anyone he mugs is carrying a deadly weapon.I especially desire this, because I don’t want to do this. I don’t like them. I don’t want them in my home. I don’t like shooting at the range. I don’t like looking at them, shopping for them, cleaning them, or even thinking about what they do to others. I loathe violence of all sorts, and hope to never have to use it. I’m a pacifist in spirit. The only way I can really hope to get away with indulging my temperament here is if others are willing to pick up the slack. I want burglars, kidnappers, thieves, and would-be mass murderers of all sorts to believe that every home in my neighborhood is heavily armed and populated by fearless gun owners – and for them to believe that my home is among them. I want every robber around every corner to hold the expectation that anyone he mugs is carrying a deadly weapon. I would like to sit in theaters, airplanes, and restaurants where the trolls and scum among us believe that they could pay the ultimate price for savagery. The thing is that I do not want to personally contribute to this cause in any way. I’m not up to it. A friend who grew up in Brooklyn in the 1960s said this was a common slogan in his neighborhood: “For every Jew a 42.” It was commonly understood that if the Jews had been heavily armed in Germany, instead of systematically disarmed by the state as they were, the rise of the Nazis would have been checked, and perhaps the Holocaust could have been prevented. Neither he nor his friends were particularly interested in doing this but the point was clear. Today, he too hopes to be a free rider on gun nuts. I’m with him on this point. What the law is should have nothing to do with our own personal choices about what we like or dislike, do or do not do. As regards guns, as with marijuana and prostitution, what the law is should have nothing to do with our own personal choices about what we like or dislike, do or do not do. This view seems nearly extinguished in our world today. If you don’t drink sodas, you are happy to ban them. If you don’t like heroin, you think others should be prevented from consuming it. If you don’t like guns, you want them banned. That’s not how the free society works. The preservation of freedom requires that we be willing to stand up for the rights of others to own and do things we do not like but which harm no one, or, in the case of guns, actually save lives. For this reason, I have far more respect for the teetotaler who favors a free market in liquor than I do for the heavy drinker who favors them same. Non-smokers should stand up for the right to smoke. And so too should people who do not own guns and have no desire to own guns stand up for the right to possess and carry. Especially in the case of guns, those of us who do not want to handle guns have a special and personal interest in defending not only gun rights but also the proliferation of weapons among the citizenry. It’s the only way that we can truly deter crime and stop crime in public places when it is unleashed. The only real means to prevent the emergence of a world safe for criminals and government is to see the proliferation of guns among everyone else. I’m sorry, but I will not do my part in this respect. But I will defend the rights of others to do so, with a sincere hope that they will own, train, and be ready. Yes, I’m a free rider, but gun owners need to know that I’m truly grateful.